This essay was written in August 2013 and was published in German in Novo Argumente. I am publishing it in English for the first time here. As I write these words, a bloody massacre is being committed by the Egyptian police and army as they attempt to clear out two Muslim Brotherhood encampments set up to protest the military coup that removed President Mohamed Morsi from power on the 3rd of July. Amid the violence that claimed hundreds of lives, the authorities declared the return of the dreaded State of Emergency, a reminder of Egypt’s decades-long dictatorship which came to end when Hosni Mubarak was deposed on the 11th of February 2011. The combination of the violent repression and the reinstatement of the State of Emergency have effectively ended Egypt’s short-lived democracy, at least for now. Yet, it all seemed so different back in the early days of the Arab uprisings at the beginning of 2011, as a wave of optimism and defiance spread from one Arab country to another promising to put an end to authoritarian rule across the region and open a new chapter of democracy and freedom for millions of Arab citizens. As Syria sinks deeper into the morass of a sectarian civil war with no end in sight, Tunisia is experiencing a political crisis that has shattered the post-uprising consensus where the first spark of the ‘Arab Spring’ was lit, and there’s little hope elsewhere. The uprising in Bahrain was put down violently with direct intervention by Saudi troops and with the implicit support of Western governments. Yemen’s leader resigned after a deal orchestrated by regional and international powers, only to be replaced by his deputy and brining no real change to Yemen. Lastly, Libya only managed to depose its leader Muammar Gaddafi following Western military intervention, only to end up under the mercy of armed militias that pay little head to the weak elected government and politicians. Where did it all go wrong? Was the failure of the Arab uprisings inevitable? Is it too early to tell as some commentators argue? 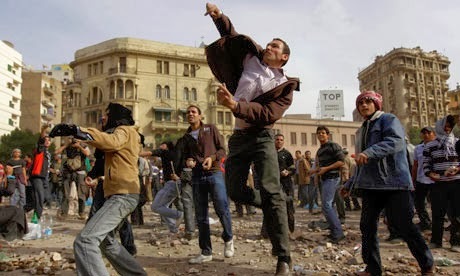 In what follows, I will argue that the Arab uprisings represented a real opportunity for change. The conditions were ripe for genuinely transformative revolutions that could sweep away the old rotting order and take confident steps towards democracy and freedom. That promise never materialised largely due to failures in leadership and political organisation. Neither the political elites nor the emerging forces were able to take control of the revolutionary wave, to give it meaning and use it to drive through change. Many reasons are given for this failure. The long decades of repression that had eroded the capacity for political organization, the petty factional squabbling, the ideological differences and, particularly in Syria, the sectarian and ethnic ‘fault lines’ that prevented the formation of a unified alternative to the existing regime are all cited as explanations. But those are only partial reasons; beyond the practicalities of setting up effective opposition there are the notions of sovereignty, sense of purpose, belief in self-determination and the responsibility to lead the transition. These are not mere platitudes. The total disregard by external powers to the sovereignty of countries like Syria and Yemen played an important role in derailing the uprisings. This was mirrored by the attitude of the political elites who often reduced themselves to the role of spectators, unwilling and unable to take control of the uprisings and build political momentum towards decisive takeover of power. The unseemly sight of Syrian opposition leaders begging for intervention in Western and Gulf capitals and not putting any effort into political organisation on the ground was the starkest manifestation of this misplaced emphasis. The depoliticisation of the uprisings was clearly illustrated by the language of humanitarianism that both external powers and internal opposition actors adopted. In Syria, Libya and Bahrain, slogans like ‘the world must do something’, ‘your silence is killing us’ and ‘never again’ illustrated this misplaced focus on external intervention. They also represented a deflection of responsibility, where external observers were perceived to be as culpable as the regimes crushing the uprisings. This rather lax definition of culpability was at odds with the fact that people were willing to risk physical harm and death to go out and demonstrate. But activists and emerging leaders had internalised the logic and discourse of interventionism and misguidedly put their faith in it. It equally showed the lack of the ability to create a language with which to discuss the uprisings, and instead fall back on the imagery and language of distant contexts like Bosnia or the Holocaust. As if the course of events during the uprisings needed to be translated into a more universal language of victimhood and shared ‘humanitarian’ narrative to acquire meaning. The crucial turning point was the Western decision to intervene in Libya, which temporarily gave hope to people in Syria in particular that intervention in their country was inevitable. The fact that the West supported crushing the uprising in Bahrain while carrying out its intervention in Libya was largely ignored, as humanitarian interventionism appeared to be experiencing a revival. The cynical and opportunistic nature of the intervention in Libya was thus left unexamined, as pundits celebrated the Western powers’ renewed appetite for humanitarian interventions. But the Western intervention in Libya was justified on the back of exaggerated claims about the number of casualties and Gaddafi’s capability of liquidating his opponents and ending the uprising. More importantly, it enshrined the assumption that people can’t hope to overthrow dictatorial repressive regimes without external help. This illustrated the erosion of the concept of self-determination that only a few decades before had driven the struggles for national independence across the world. The intervention was to have two catastrophic consequences that will take a long time to rectify. Firstly, it enabled a not yet mature political opposition to achieve a military victory without having the chance to determine what it was fighting for beyond the overthrow of Gaddafi. Secondly, it created highly armed militias that were largely free from political control and enabled them to become a decisive power on the ground in Libya. Both outcomes now contribute to the largely-ignored perpetual crisis in Libya as a weak and ineffectual government finds itself threatened by armed militias and unable to push the country forward. The intervention deprived the Libyan people of the chance to give meaning to their struggle and to organize themselves politically, paving the way for a transition towards democracy in the aftermath of Gaddafi’s overthrow. Instead, the Libyan people were gifted a hollow victory and an unmanageable state that has dropped off the radar of Western media and politicians. Western interest is revived in extreme situations, such as in the aftermath of the attack on the US consulate in Benghazi on 11 September 2012, but that has encouraged little speculation about the connection between the intervention and Libya’s current political and security landscape. But humanitarian interventionism has little patience for such considerations. It prefers to deal in existential absolutes: it was either the intervention or the annihilation of the Libyan opposition. This is a completely inaccurate and ahistorical view. One wonders how the Vietnamese or the Algerian people would have embarked on their long and bloody struggles against formidable imperial powers if this kind of logic had prevailed a few decades ago. The logic of interventionism is superficial and expedient; it prefers to portray people as victims in need of assistance rather than political agents capable of conducting their struggles independently and willing to pay the heavy toll of sacrifice to achieve their aims. The real problem that faced the Arab uprisings was that the logic peddled by interventionists was mirrored and internalised by opposition leaders and activists as they regarded their struggles as fragile endeavours requiring external intervention in order to succeed. While the media always played its role historically in covering struggles in shifting public opinion, think of the Vietnam war, the emphasis shifted as appealing to the media acquired a far more central role. Much effort for example was expanded by Syrian activists on Twitter campaigns encouraging Western people and celebrities in particular to take interest in Syria and support the uprising. But what does it really mean for external observers to support the uprising? Why would a French citizen or an American celebrity be expected to understand the political complexities of Syria and speak authoritatively about them? Political struggles gain their meaning from context and experience; they are not about the competition to gain victim status. In reality, such attempts were intended to serve one purpose: to encourage Western intervention. Tragically, these misplaced efforts contrasted with the lack of ability to communicate with reluctant Syrians and to expand the popular base of the uprising. The Syrian regime successfully exploited the country’s sectarian and ethnic divisions to preserve its hold on power, as it would have been expected to. The oppositions’ failure to develop a narrative that would galvanize Syrians against the Ba’ath regime and counter its attempts at exploiting divisions is to blame for the uprising’s degeneration into a civil war. Throughout the uprising, global and regional powers rode roughshod over Syria’s sovereignty and continued to meddle persistently in the conflict. But the moral posturing by Western powers, led by the US, failed to mask the lack of a clear sense of strategic interest in Syria that would inform Western policy there. Two and half years into the conflict, the West remains completely incapable of acting decisively in Syria. While interventionists ascribe this to cowardice, in reality it reflects the paradox that the US administration and its allies have created for themselves: the desire to play the role of humanitarian agents against an unwieldy situation they have little control over and can see no desirable outcome out of. And yet, rather than disengaging and allowing Syrians to resolve the situation by themselves, the US and its allies continued their attempts to build viable opposition bodies despite their multiple failures. They also continued to supply ‘non-lethal’ aid to Syria rebels, and allowed their allies such as Qatar, Saudi Arabia and Turkey to supply them with weapons. This foolish meddling drew further actors into the Syrian conflict, as Iran and the Lebanese party Hezbollah escalated their support for the Syrian regime in the face of what they perceived as a plan to replace the Syrian regime with a Western-friendly government. Russia also maintained its support for Assad. The escalation of the Syrian war was a direct result of this sustained yet purposeless meddling by Western powers. It’s not hard to see how this was a product of the humanitarian brand of interventionism which contrasts with traditional imperial interventions that were driven by clear understanding of strategic outcomes. But the West has only itself to blame, as it prioritised short-termist policies designed to make it appear to have a moral sense of purpose but were in reality short-sighted adventures lacking both understanding of complex situations and a view of long-term interests. The failures of the Syrian uprising are twofold: on the one hand, the political opposition failed to organise effectively and build grassroots support and develop a clear political narrative to galvanize wide support. On the other hand, the opposition failed to take control of armed rebel units and establish centralised military leadership that can coordinate operations and aims. As a result, Islamist elements of various shades were able to exploit those weaknesses to fill the vacuum left by the opposition and organise themselves both militarily and politically, expanding their control over ‘liberated’ areas. The Islamists, formed of several jihadist factions some of which are affiliated openly with al-Qaeda, succeeded where the ‘external opposition’ failed for two reasons. Firstly, they are working directly on the ground and among the people, not trying to direct events from the comfort of Western and Gulf cities. Secondly, unlike the opposition they had a clear political narrative driven by an Islamist agenda. Both contributed to their success in recruiting supporters and expanding their control, aided by the weapon supplies they were receiving from Gulf countries. Curiously even when it comes to this straight-forward case of the rise of Islamists, interventionists attempt to twist this and present as a consequence of lack of early intervention in Syria by the West. In its most blatant form, the argument goes that the Western reluctance to intervene militarily to get rid of Assad inevitably allowed the Islamists to exploit the situation and gain prominence in Syria. The hold of the logic of interventionism on political discourse is so entrenched these days that it blinds many to actual causes and effects and understanding of political developments. Tellingly, this argument was championed both by western interventionists and the Syrian oppositions itself. For the first group, it was a vindication of their position that intervention should be considered the default option in foreign policy. For the Syrian opposition, it was a blatant attempt at justifying their failures by deflecting responsibility for the failure of the uprising from themselves to the West. This is an alarming convergence in opinion that attests to how insidious the logic of interventionism has become and the hold that it now has on the political imagination. By a cruel twist of fate, the Arab uprisings started during a period of general political disorientation across the world, in which the concepts of autonomy, agency and self-determination had lost their value as philosophical underpinnings of political action. Sovereignty as the national manifestation of autonomy had come under sustained attack as the discourse of interventionism gained ground, marginalising real constituencies in favour of virtual entities like the ‘international community’. But sovereignty is essential as a framework for political action. When Western powers make claims about ‘what the Syrian or Libyan want’ they are not truly representative of those aspirations but they are imposing external interpretations that have no solid foundation among genuine constituencies. Such abstractions can’t substitute for the real political conflict among people to shape their destinies and their societies. Tragically, even people rising up against authoritarian rulers now subscribe to this degenerate view of politics and have little conviction in the value of self-determination and autonomy. Their sacrifices and political energies are squandered as they miss the opportunity to take their fate into their own hands. The West has succeeded in exporting a flawed conception of political struggle in its desperation to regain a moral sense of purpose built on expedient and erratic interventionist adventures. But the hypocrisy of the Western position, driven more by cynical calculations rather than principled belief in universal democratic values was clear to see in the case of Bahrain and more recently in Egypt. The US and EU effectively endorsed the military regime that carried out the coup against an elected president, with vague statements about resuming the transitions towards democracy despite the massacres of hundreds of Muslim Brotherhood supporters by the regime. Arch-interventionist former British PM Tony Blair went a step further than most, fully endorsing the military regime and arguing that had no choice but to topple Morsi. This hypocrisy should highlight how little faith in democracy the Western proponents of interventionism actually have. And it’s hardly a surprise; interventionism is intrinsically dismissive of its objects of pity. When it can control your life and death, your voting choices will hardly matter. The resurgence of the doctrine of interventionism after the catastrophic interventions in Afghanistan and Iraq shows that its advocates can learn very little from experience, as interventions in Libya and Mali are touted as successes with very little real consideration of consequences. It would not be an exaggeration to say that a healthy understanding of politics and struggles for democracy cannot be developed without defeating the perverse influence of interventionism. In parallel, the resurgence of the role of agency and self-determination are a prerequisite for those struggles to achieve their purpose.